Here we have the finished product! The owner has it all back together now and on the the road. He’s got himself a real head turner now. This Tundra is in the shop to get fresh coat of paint. With all of the off roading stickers on here, Im going to assume that this rig has seen a few miles in the woods but now its time to straighten out a few of those dings and scratches and make this thing shine again. We started by removing the bed the handles the mirrors and various other parts from the truck. In trying not to get too out of hand on this one, we didnt completely disassemble the truck like we would for a higher end job, but the finished product will still look pretty good. We then repaired a few dents, installed a new left fender and started sanding the rest of the truck. Since we had the bed ready first, it went on into the booth for painting. We will also be doing a spray in bedliner on here next week. We painted the front of the truck today but didnt get an pictures of it in clear. You will have to wait to see that next week when its all wrapped up. 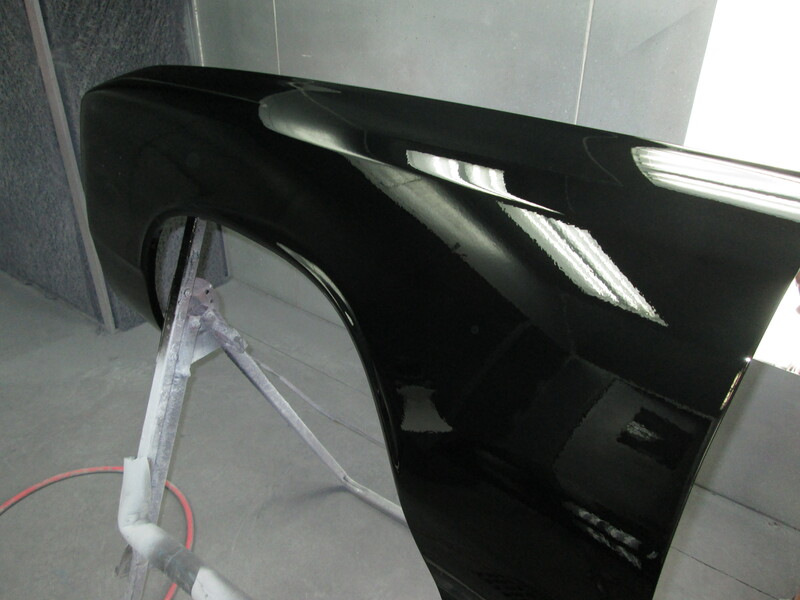 While Chris was working on the Kia, Chase was busy adding even more shine to the trunk lid that he painted on Friday. Make no mistake, that trunk was beautifully painted and would have looked great on any car. But this isnt just any car. This car is getting a High Performance Finish, so we are going the extra mile. Chase first started off by block sanding the trunk with 1000 grit paper, he then switched to 2000 grit paper. After that he went back over that with 3000 grit paper. Then the buffing process starts. 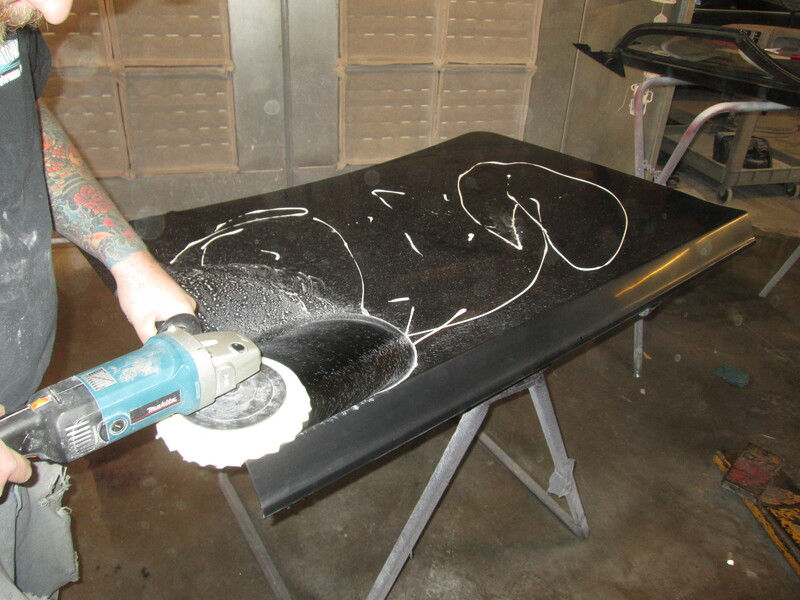 He uses a heavy cut compound first to remove the heavy scratches. Then a mild cut compound to even further cut scratches. 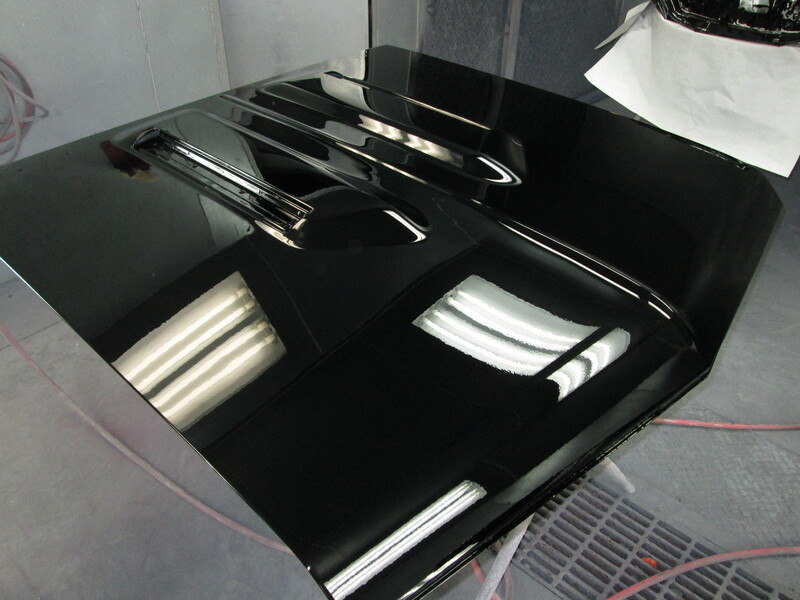 After that a super fine polishing compound to ensure a super glossy mirror like reflection. Just check out that picture of Chris. Pretty sharp! Basic black. It looks good on anything. Take this Chevelle for example. After spending a bit over a week sanding our fingers to the bone we are, finally, ready to add some zing! to this car. All the boring stuff is behind us, at least on these parts, so it is time to party. 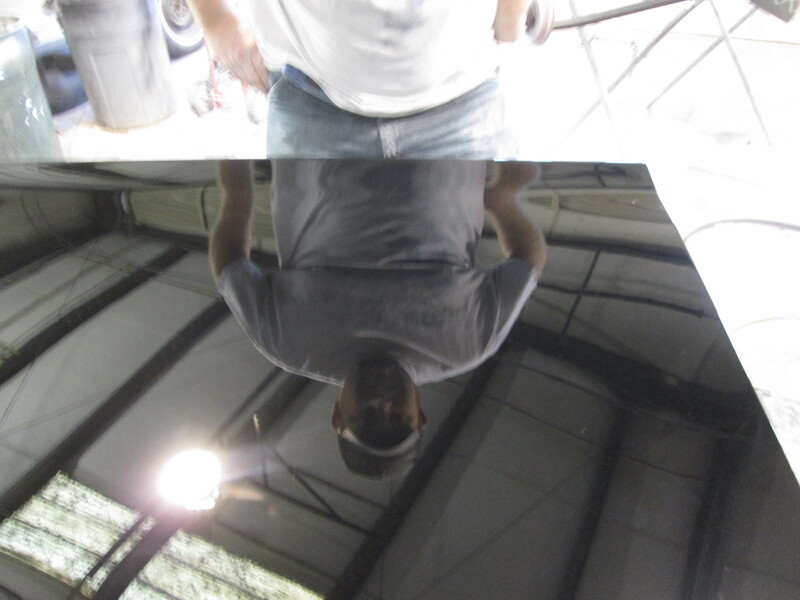 In the first photo Chase is laying down a coating of the urethane sealer. The sealer, strangely enough, seals all the fillers and primers below it and provides a smooth, consistent color, base for the paint. The sealer is available in seven shades of gray, from nearly white to almost black. The darker the paint, normally, the darker the sealer. The paint on this car is black so this is the darkest of the available colors. The second photo shows all the parts with the first base coat applied. 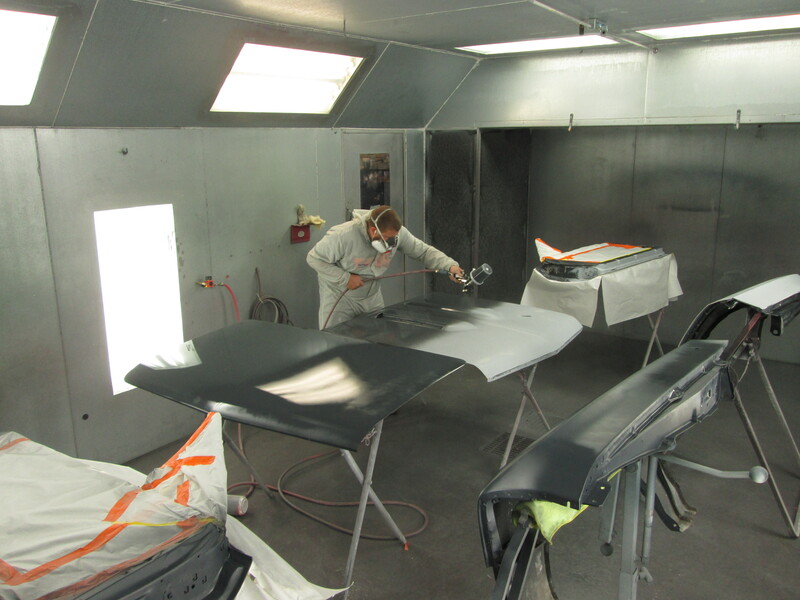 We will apply anywhere from three to five coats of base to ensure good coverage and uniform color. With all the parts stacked up in the booth like that it is like running a obstacle course in there trying to move around without touching anything. You will notice in the second picture that the parts look, well, dull … flat even. How can we make a High Performance Finish out of that? The secret is in the paint. 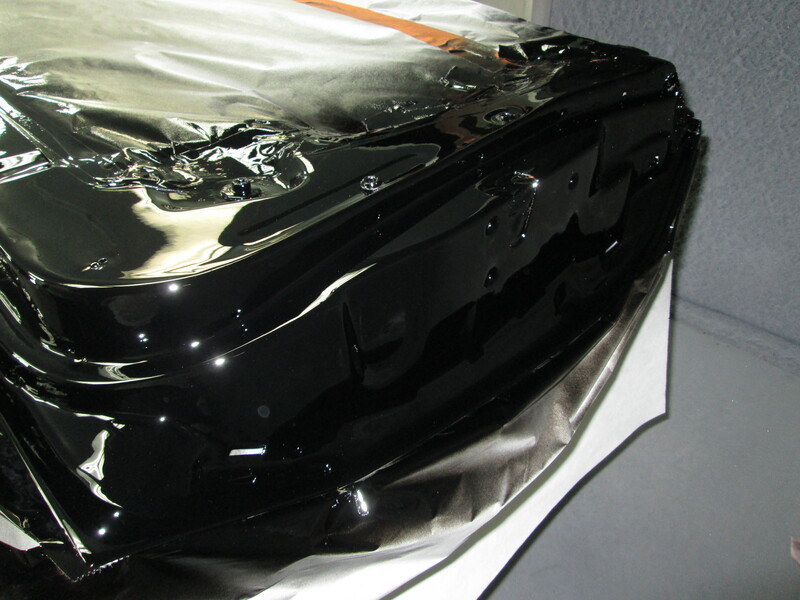 The base coat, which you see in picture two, dries to a near flat finish. 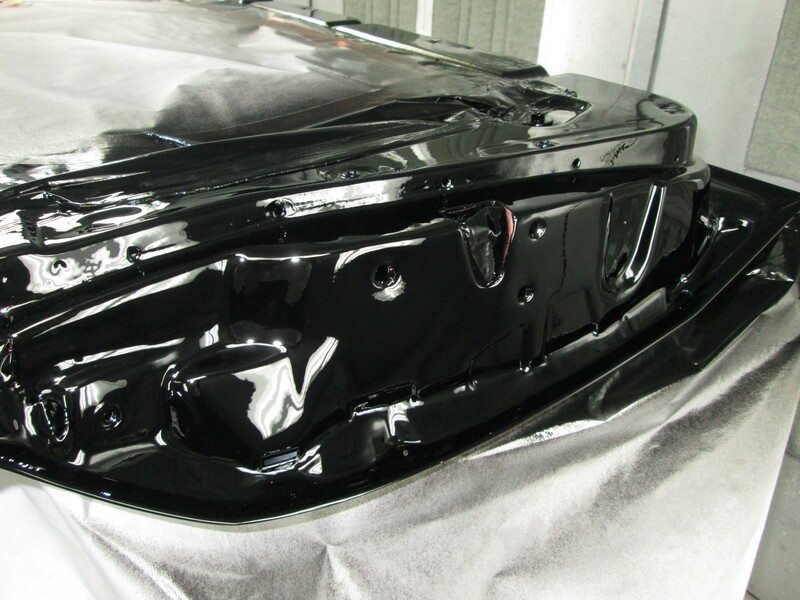 It’s not supposed to be glossy, it’s job is to provide the color and nothing else. Photos three through eight demonstrates quite clearly (no pun intended) what happens when the clear coat goes on. 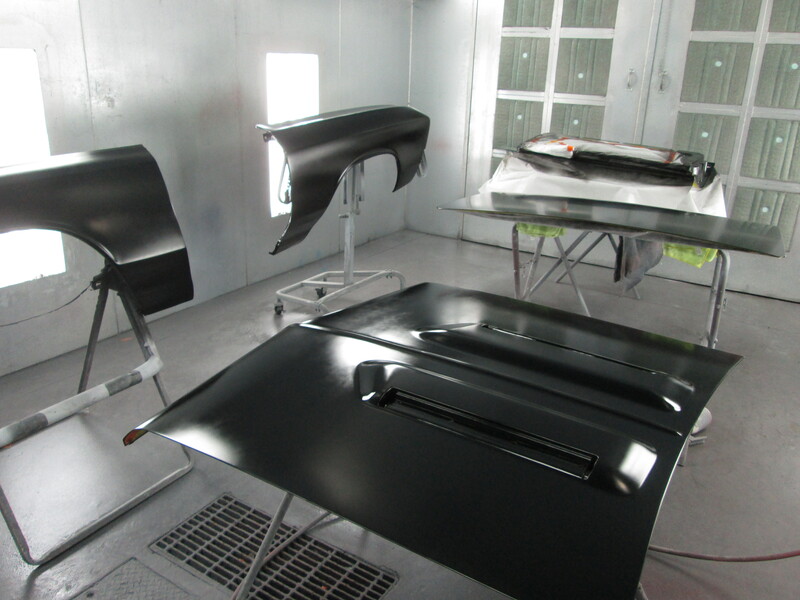 JMC AutoworX, as do most paint shops, use a two stage paint system. The base coat is the first stage and provides the color. 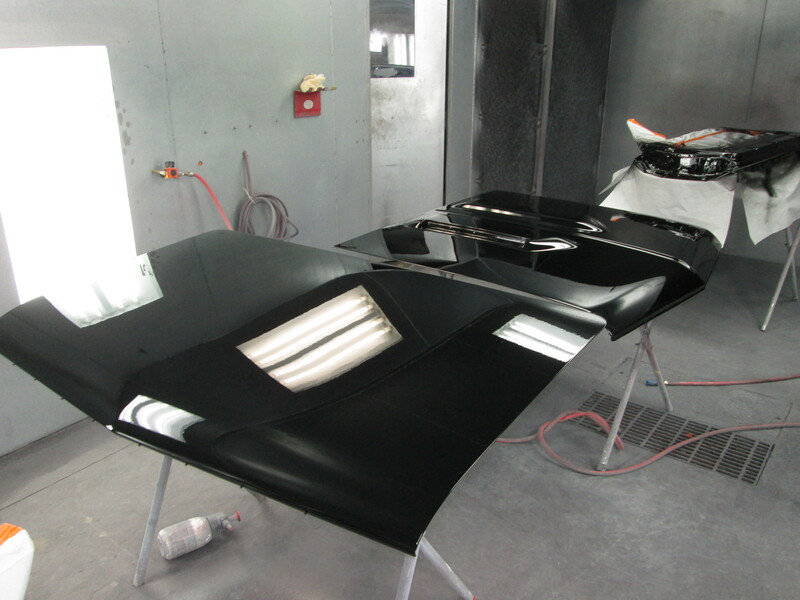 The clear coat is the second stage and provides luster and protection to the finish. Black is a great color to paint. When you get it right, as we have here, there is nothing else out there that will provide the gloss and reflective properties of black paint. It become a mirror. But as good as these parts look now, and they do look very good, we still have more to do. A good finish simply won’t do for a High Performance Finish, we want a great finish and will settle for nothing less. 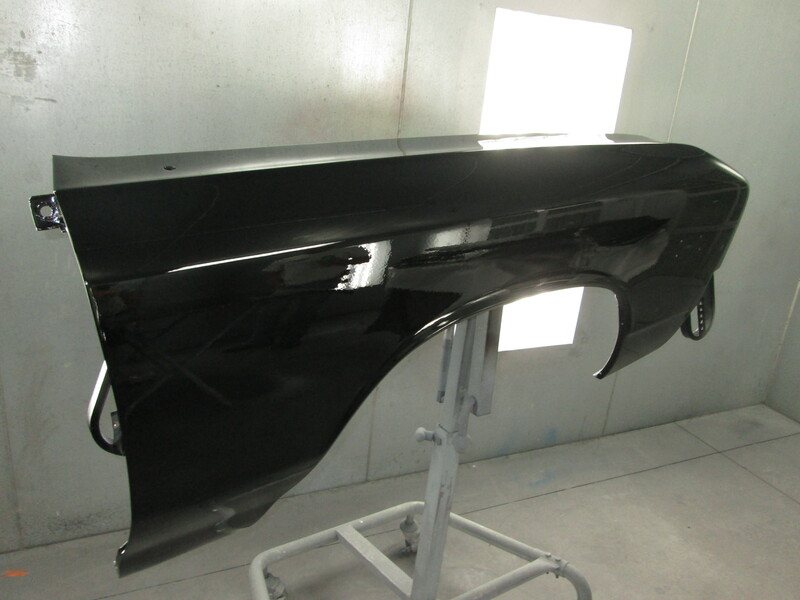 Before this becomes the finish this car deserves, a High Performance Finish, we will sand the paint, twice, and buff it three times, to reveal the true beauty lurking just below the surface. Then … and only then, will you see what basic black really looks like.